Teddy and the Yeti: Incoming! is colored! News of Teddy and the Yeti's demise has been greatly exaggerated. 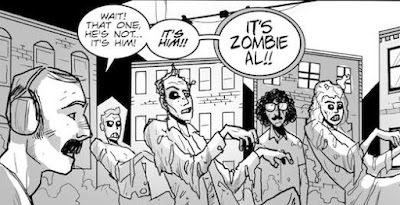 There's work coming in at a slow but steady clip, and I'll be excited when I can announce the next issue's arrival date (believe me). Suffice it to say that it will be relatively soon, and I can only hope that it will be worth the wait. In the meantime, a short story, long in the making, was completed just two days ago when Leonardo Pietro (who I've worked with on a few FUBAR stories) sent me colored versions of our "Incoming!" story. Oh my goodness is it great. Above is one panel from the story, which features a familiar looking (and adorable) dog. Each panel lives up to this one. It's gonna blow people away. It certainly did with me. It was only a matter of time, then, as a lover of old comic book ads and a creator in some sense, that I put together my own version, which you can see at the very top of this post. I hope to get this ad in a monster comic that I've been contributing to, which explains the theme of my parody. Art on this beauty comes from a familiar source - fellow Teddy and the Yeti creator Duane Redhead, proving that he is a man of many styles and many talents. Duane put this together in no time at all and he captured the feel of the original ad like few other parodies have. Rafer Roberts - he of the Magic Bullet publication - is graciously coloring this short piece, which I'll show off when the time is right. I'm fumbling my way through lettering, trying to sufficiently capture the older style you see in the original ad - I'm attempting to hand draw the balloons, which will probably be a horrible failure, but I've got my fingers crossed on that front. 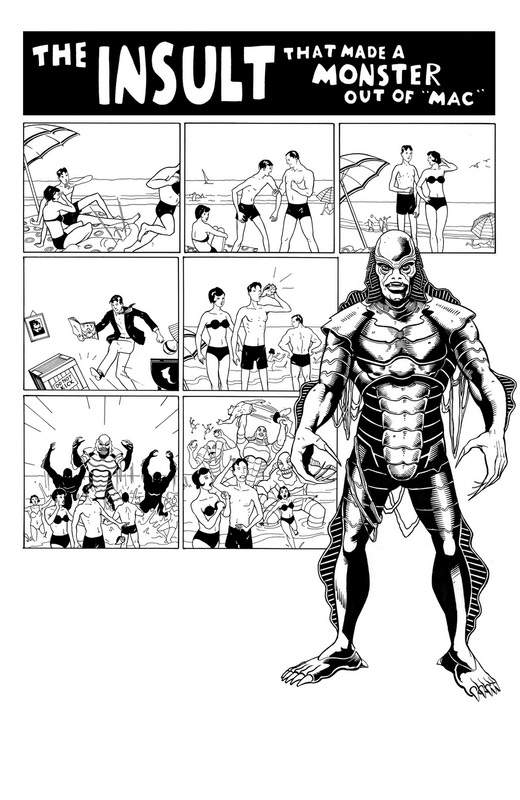 You may recognize the monster in the top image as the Creature from the Black Lagoon, and while that monster is 100% fit for this parody, Duane went ahead and made some tweaks to the design to avoid any pesky lawsuits (I'm unsure that we couldn't have used the character as we're putting together an obvious parody, but whatever). 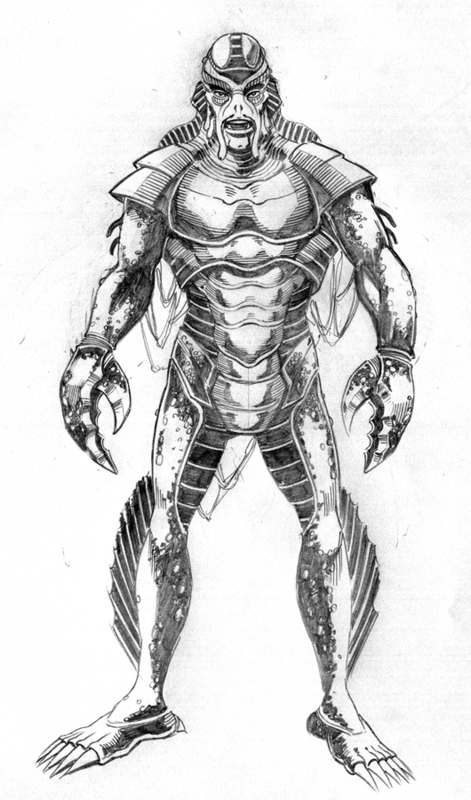 The redesign is below, and it looks like Duane added some great Dr. Zoidberg elements to the monster this time around. "Who's intimidating who now, Big City?" The preparations for the San Diego Comic-Con continue, with much of this month being devoted to CCI's independent film festival, for which there's a brand new Franks and Beans in the works. The new episode, which is titled "Double Delivery", won't be up online for all to see until one of two things happens: the film festival committee decides to kick our entry to the curb, or the committee accepts it for a screening for the convention weekend. I have no idea how many films are submitted and accepted, so I really can't guess what our chances are at getting this thing on the big screen. But if that were to happen...wow, look out. Views on the titular internet show might jump all the way from "no one" to "some people" and I'd be super excited about that! Larry and I put together an introduction of sorts in hopes that the Comic-Con crew just stumbles upon it and gets an extra dose of F&B before watching the submission entry. I'll be posting it up on CCI's Facebook page in the next few days. To clarify, this isn't our official entry, just something introducing it and, hopefully, getting more eyes to Franks and Beans. The deadline for entries is February 1st, and we'll know if we've been accepted sometime in June. Fingers crossed. Here's a production still (part of the application process) from the episode! Comic-Con film festival judges, get ready! AND CHOOSE US! Please. 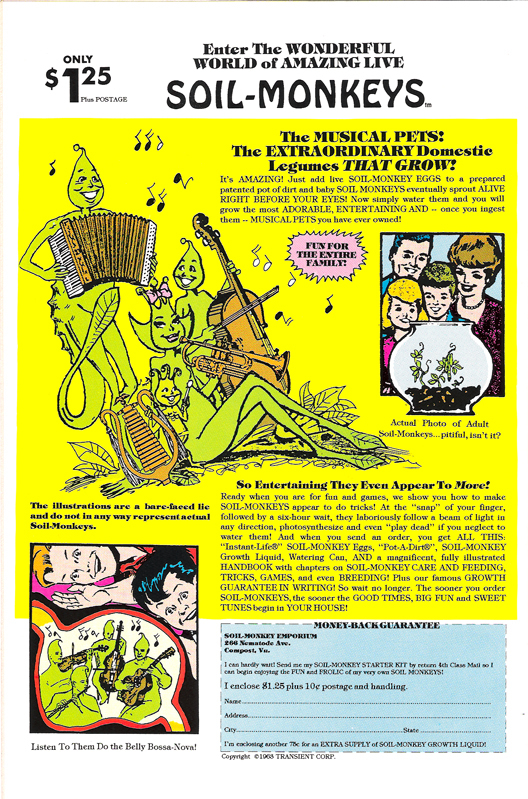 great fake ads from Image's "1963"
I recently picked up Image's full (but sadly never quite completed) run of the Alan Moore-written 1963 series, which re-imagines the creation of the Silver Age Marvel Comics. 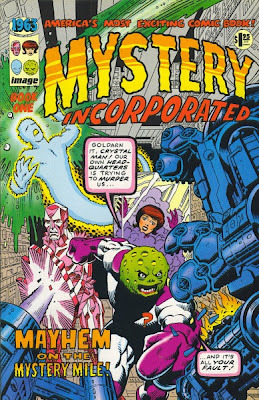 The first issue features a Fantastic Four-style story, which should be obvious from the above image. The series is much more straight forward than I had imagined it would be, other than some well-placed barbs regarding the rights of individual creators and, particularly, Stan Lee. 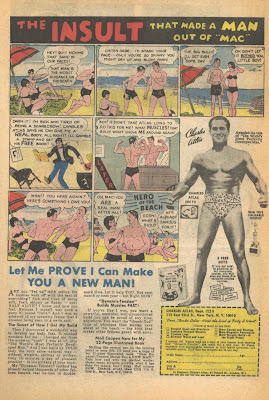 Moore and his stable of artists create such a complete package, down to fully formed letters pages, editorials and even (mostly) fake ads that mimic some of the best comic advertisements of the time - ones that are immediately recognizable despite their altered status, which I suppose is the mark of a great parody. 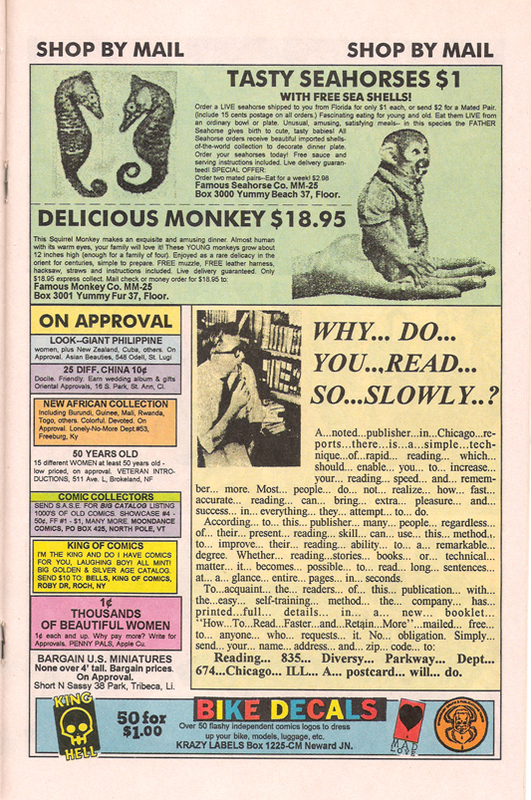 First off is a back cover ad for "soil monkeys", which is an obvious take on the well-loved Sea Monkeys ads. Soil Monkeys, upon further inspection, are merely beans, which is funny on two levels, the less obvious being a commentary on the fact that Sea Monkey ads don't really represent an accurate depiction of what you actually get - a mini aquarium of tiny brine shrimp. Soil Monkeys make music, because, well...you get it. This next ad, from an interior page, might just beat out the previous one due to the sheer number of great parodies it contains. 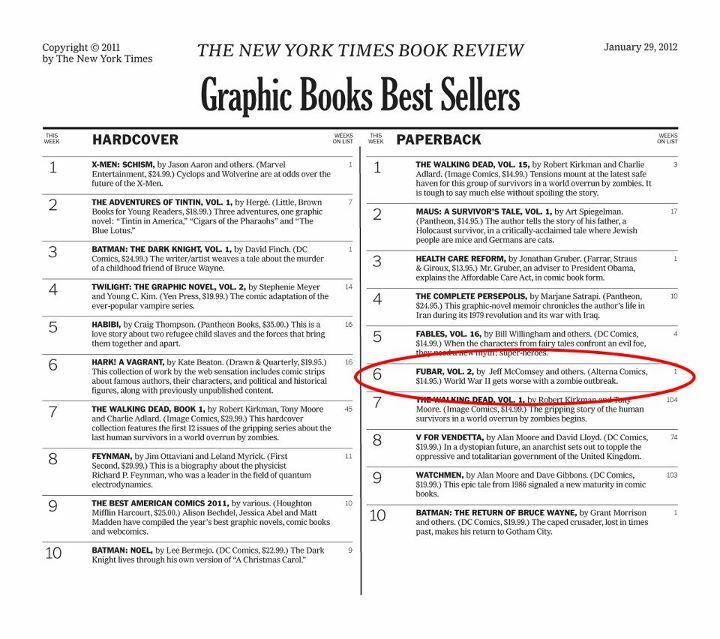 My favorite is at top, where we learn that readers can not only order real, live animals from a comic book, but also eat them. 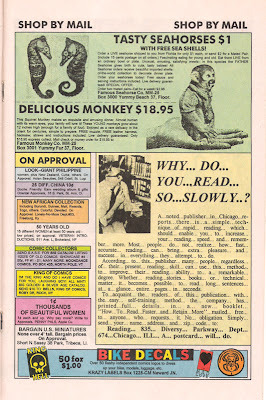 This is a parody of an old ad that I have railed about regarding animals and the ability to buy them through shady circumstances from the pages of a comic book. 1963 is a faithful recreation of early Marvel super hero comics, with all the good and bad that comes with it. Despite the fact that Moore is by far the best comic writer of all time, this title isn't for everyone. The ads, though...those are golden. FUBAR wins IGN award; on New York Times best sellers list! 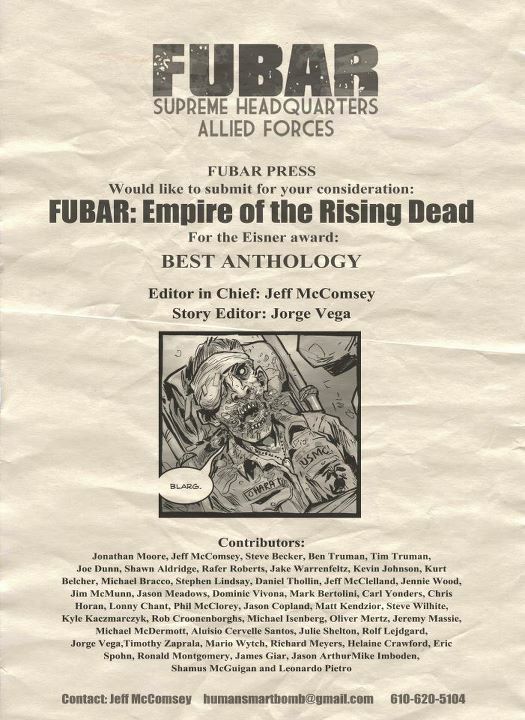 The news for FUBAR: Empire of the Rising Dead just keeps getting better. 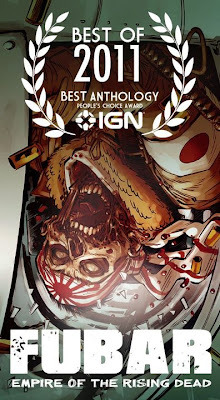 Voting ended a week or so ago for IGN's "People's Choice Award" and FUBAR won for "best anthology of 2011". 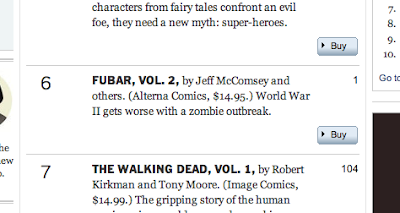 This is great news and it means that, against stiff competition, FUBAR had a lot of fans out there who were willing to click the "vote" button to show their support. If you were one of those button pushers, then I thank you. This is real. I did not make this up. This is also fantastic, and much of the thanks goes to Jeff McComsey, Steve Becker and Dominic Vivona who put such hard work in to promote this book. 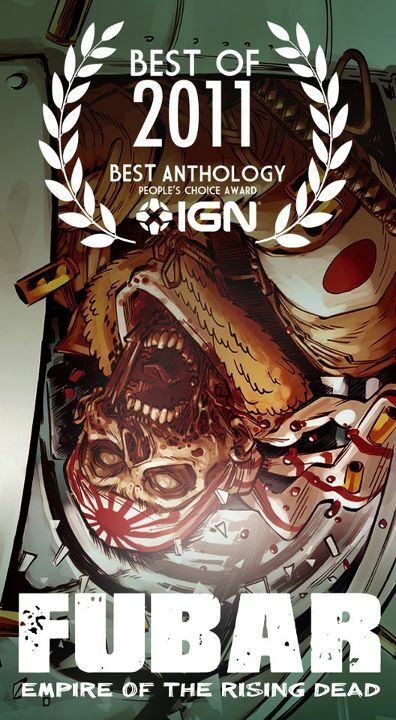 The artists who worked on my writing contributions (McComsey, Mario Wytch and Leonardo Pietro) also deserve a heaping of praise and I'm happy to be associated with them and this book. What a thrill. 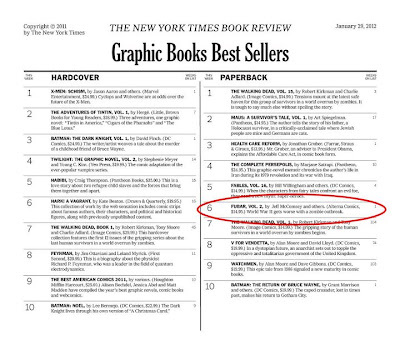 Perhaps I'll introduce myself from now on as "IGN award winning and New York Times best selling author Jeff McClelland". But perhaps not. This is FUBAR's submission for Eisner Award consideration. This submission, obviously, doesn't guarantee that we'll even be in the running for an Eisner, which is the most prestigious award in comics. But wouldn't that be something? I believe that Eisner award winners are announced at Comic-Con International. As I'll be there in 2012, I'd be happy to accept the award. And, you know, any monetary prize that might come along with it. my trip to Pittsburgh's Toonseum! This weekend, I took a trip to Pittsburgh's Cultural District to visit the Toonseum, a cartoon and comic art museum that is one of only three like it in the country! The Toonseum opened a few years ago, but this was my first time there, and I didn't know what to expect. It ended up being a lot of fun, and I took a ton of pictures, which I'll show below. hours: LOOK THEM UP YOURSELF!! These huge statues greet you just outside of the museum. I have no idea if they are part of the Toonseum or not, but they set the stage for sure. Plus at night, they come alive. It's true. Here's the outside of the Toonseum! 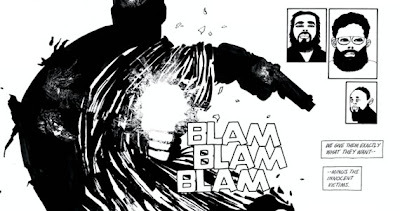 I'm not sure how I feel about the "Bam! Pow! Smash!" effects at the top. I mean, they're recognizable, but there aren't better ways to represent cartoon art then through stereotypes? One of the first things you see upon entering is a Sunday comic strip exhibit, featuring a number of comic strips, all from the same Sunday. Here's one of my favorite, Monty. Actually, I liked it a lot more when it was called Robotman, but...change is a part of life. I guess. Here's a wider view of all the original comic strip art. There's even a mustache joke! Great. There was a lot of great original art on display, including a frame from Gertie the Dinosaur, one of the first cartoons ever, but this might have been my favorite of all of them: a Mel Blanc Bugs Bunny! This was a desk in what apparently was the "office" area of the museum. I have no idea if I was allowed back here or not. Oh well. This was one of the few "artist boards" I saw, featuring signatures and sketches from many great artists, including Jerry Robinson, Caroll Spinney and Mark Schultz! I know an original Jack Kirby piece when I see it! This was the hallway that led to the second exhibit room. It was really cool to see this original animation cell from the generally awful Star Trek cartoon. I will always think of the Black Vulcan from the character's role in Adult Swim's Harvey Birdman: Attorney at Law. Aquaman, even your villains are terrible. Classic covers on the wall! "Cobblepot for mayor". Fantastic. This was right next to bookshelves filled with comic and cartoon reference books. I wish I could caption this...but I can't. It's still pretty cool. At the front of the museum sits an art desk used for many Disney productions including Fantasia. Guests are encouraged to draw on it, and the best I could come up with was Tin Tin with a mustache. I think it worked. Giant anvil jokes always work. Always! I had a great time at the Toonseum and will be making my way back there before too long. Anyone from Pittsburgh and anyone with a love of the medium should stop by and see it for themselves. Here's hoping for continued success and growth for what is a very cool pop culture museum. "Holy Terror" is probably the worst comic I've ever read. Like many fans of the medium, some of my favorite comics are by Frank Miller - a giant in the industry if there ever was one. Here's a guy who had created - mostly on his own - entertaining, sprawling, seminal epics like 300 and Sin City. Heck, Batman has been around for 70 years and I don't think I've ever read a better story featuring the character than Batman: Year One. 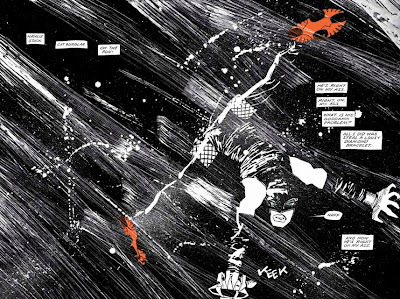 When The Dark Knight Returns is second on a list of favorite Batman stories by one author, you know that there's some serious, prodigious, even, talent going around. Because of this, and even though Miller has had a few flops to go along with his big hits, I was excited when I heard that DC Comics was publishing Batman: Holy Terror!, an original graphic novel by Miller. My interest turned into curiosity once I learned that DC rejected Miller's proposal, at which point he took the concept to Legendary Comics (which seems to have been created for the sole purpose of publishing the book), removed the references to Batman from the story and truncated the title to, simply, Holy Terror. My curiosity, in turn, became more of the morbid variety when the book was finally released and the reviews started to trickle in. It seemed to me that, despite the interest surrounding the book, most of the reviews were overwhelmingly negative. I saw the book stocked in a few local comic book shops, but didn't bother to flip through to check it out. I probably would have forgotten all about the book if it hadn't been for my spring semester English classes. The theme for the course centered around arguments - understanding them, making them effectively - and since I'm, well, a comic book fan, I started thinking about this book, the firestorm of criticism it caused for a while, and how something so apparently opinionated might work in a class that is set up to evaluate such forms of literature. When I started putting my syllabus for the class together, I decided to take a chance and I ordered a copy of Holy Terror to read. AND I HATED IT. Seriously, every negative review of this book that I read was spot on. It was, in a word, frightening to see how far Miller had slipped from "crime noir with its harsh view of reality" to "blatant, unrepentant racism", how a man so obviously talented could find himself so overcome by apparent hate as to put out a book such as Holy Terror. 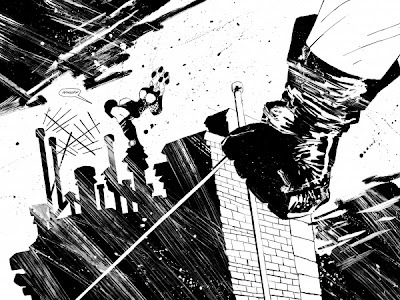 The main characters are simply placeholders for Batman, Catwoman, Jim Gordon and other Gotham mainstays; some have even said that Miller took finished pages from his DC pitch and changed only a few details, presumably to avoid any legal issues with DC. When I first heard that DC rejected Miller's pitch, I was surprised and thought that perhaps the company was overreacting. Now that I've read the finished product, it's obvious that DC did the only thing it could have done, because allowing Miller to publish this as a Batman story would have, in my opinion, caused irreparable harm to the character and the overall concept. The book, which simply deals with one night of violence, torture, ethnic stereotyping and misogyny to the worst degree, comes off as vapid in its content and disturbing in its message. It can be difficult, sometimes, to separate an artist from his or her works, but in this case you almost have to to justify keeping anything of Miller's in your library. It really is that shameful a piece of work. 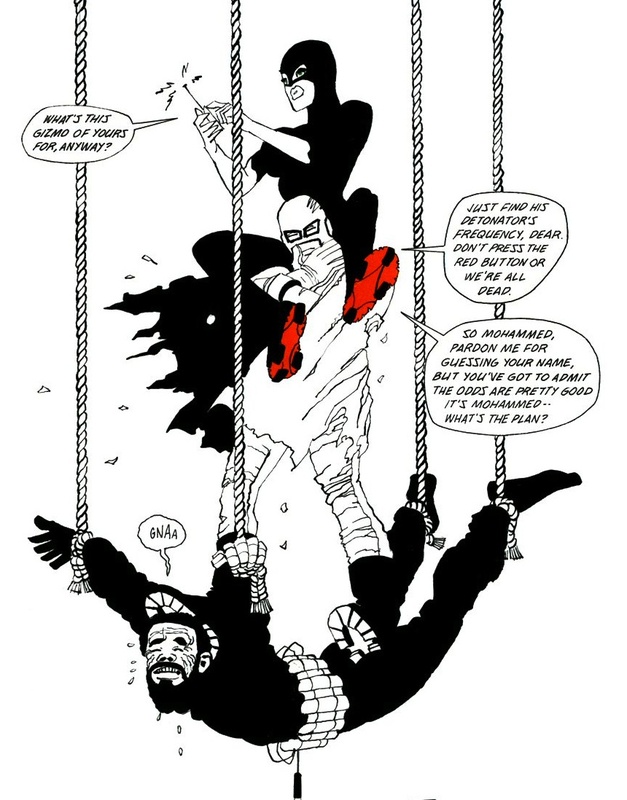 I wrote a short review of the excellent anthology set 9/11: Artists Respond a while ago. In one of the two volumes released, Miller had a short, simple story that read something like "I'm sick of flags; I'm sick of God; I've seen the power of faith" with an image of wreckage from the Trade Center attacks. Miller seems to be playing again on this feeling of outrage, of indignation, but while the 9/11 short showcased the raw emotion that many felt that day, Holy Terror seems more venomous, more cruel and more bigoted. I think that freedoms of speech and expression should be inalienable human rights, and thus I think that Miller should be able to print something like this, inflammatory as it is. But I also can't strongly enough recommend that we all use a bit of common sense, don't get caught up in Miller's understandable level of fame, and put this book back on the shelf instead of buying it. I took a trip this weekend to visit some family near Allentown, PA (famous for the Billy Joel song and NOTHING ELSE), and while I was there we managed a little day trip to New York and surrounding areas. My brother-in-law, great guy that he is, mentioned that the Kevin Smith owned comic shop, Jay and Silent Bob's Secret Stash, was nearby, so an impromptu side trip was quickly undertaken! Below are some pictures of the shop, which was a pretty neat place. While I'm not Kevin Smith's biggest fan in the world, I have seen most of his movies and I've enjoyed more than a few (the night before, thought, I watched Red State and MAN was it dark!). I also think that, despite the fact that he does tend to reuse plot points and character traits, and despite his lack of ability to stick to a deadline, I think he's good for the comic industry and I have enjoyed most of his work. His Green Arrow run from, what, 10 years ago (?) remains a favorite for me. You've got to admit, however you feel about the man, it's pretty cool that he owns his own comic book shop. The above two pictures are, of course, from outside the shop in Red Bank, New Jersey. Red Bank was a pretty hip place all around, it seemed, and we spent some time in town afterwards. One of the first things you see when entering the shop is this sign from Clerks. There were props and memorabilia from a number of Smith's movies all over the place, which was pretty neat. It beats storing them in some garage for years on end. Here's the front of the store, complete with New Jersey Devils banners and framed Batman comics. Smith supposedly works in the store from time to time (i.e. whenever he feels like it), though he wasn't there this day. I wonder how often he does come in with the amount of time he spends directing and filming. The store seemed pretty big for a comic shop, which allowed for the showcase areas with movie and comic props. There was a hefty supply of comics written by Smith at the front of the store, some of which he had signed. These were on sale for no extra charge, which I thought was pretty thoughtful of the guy. The back of the store was a little more unorganized, with comics and props in random places as if this part was still under construction. Even so, there were some neat, bigger items in the back such as outfits from Clerks II. And look! Here's Mooby the Golden Calf from Dogma and a number of movies. I'd like to think that Jesus is my buddy, too. I wonder who designed this thing. ...yep. I'm not sure what else needs to be said about it. But since it's a Fantastic Four parody, I had to take a picture. On one side of the store, above the back issue bins of comics, there are what I assume to be original Alex Ross paintings. Smith currently writes a Green Hornet comic for Dynamite Entertainment and Ross does the covers, which explains the connection. It was pretty cool to see these, which were placed so inconspicuously that I almost didn't see them. I ended up buying a couple things, including these two autographed Batman comics. I said it before, but it bears repeating: it's cool that the guy comes in, signs some of his stuff, and then sells it without marking it up in price at all. This was a cool, unique shop, and I had a good time looking at all of the original comic art, movie props and general merchandise. And the place was jumpin' when I was there, too! If you're ever near Red Bank, NJ, stop in and see it for yourself. Oh, and I found lots of Mug Cream Soda in nearby Staten Island. I bought a lot of it. Dear Pepsi, sell Mug Cream Soda in the Pittsburgh area so I don't have to travel to New York to buy it! Love, Jeff. This blog doesn't have enough FUBAR news.